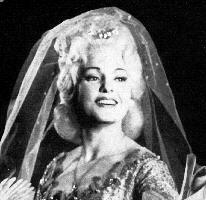 The mezzo soprano, Alexandrina Milcheva, was born on 12 November 1936 in Shouman. At the State Conservatory of Music in Sofia she was a student of Georgi Cherkin. Her debut was with the Varna Opera in 1961 singing the role of Dorabella in Cosi fan tutte. After winning the First Grand Prize in the International Competition of Toulouse in 1965 she became a member of the Sofia National Opera. In 1976 Alexandrina Milcheva began a long series of guest appearances that took her to the major opera stages of Europe and the United States. Her debut with the Vienna State Opera in 1976 was as Carmen. Following this were performances in Munich, Verona, Barcelona, Florence, Glyndebourne, Covent Garden and Moscow. In 1987 she was the Azucena in a Salzburg Festival production of Il Trovatore conducted by Herbert von Karajan. At the Paris Opera in 1984 she appeared as Marina in Boris Godunov. In La Scala she was Marfa in Khovantchina. Following her debut in the United States in Michigan where she sang Carmen in 1976, engagements included Adalgisa in San Francisco during 1978, Chicago in 1987 where she was Laura in La Gioconda, Carnegie Hall in 1986 as Laura, Dallas in 1992 as the Princess in Suor Angelica and her Metropolitan Opera debut as Dalila in Samson et Dalila. In addition to a very successful career as a concert and oratorio singer, major roles in her career included: Azucena, Adalgisa, Principessa (Adriana Lecouvreur), Dalila, Cenerentola, Carmen, Octavian and Charlotte. Glinka: Life for the Czar "Aria of Vanya, Act 4"
Massenet: Werther "Charlottes Letter Scene"